ZIONSVILLE, Ind. -- A Zionsville homeowner has been left on the hook to clean up an oil mess from a UPS truck in his driveway. 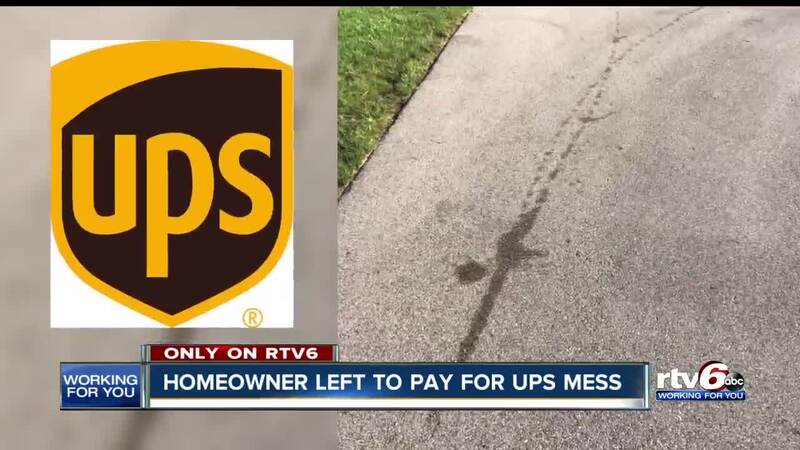 On Aug. 22, a UPS delivery truck left oil streaks on the asphalt of Jake Edgerton's Zionsville driveway. "Those were not there that morning but they were there right after the UPS truck left though," Edgerton said. A UPS manager came to inspect the problem, agreeing that UPS was at fault. But when Liberty Mutual, the insurer for UPS, came to verify the claim, the company told him to get an estimate. Edgerton received an estimate of $500 to scrub it down and put chemicals on the driveway. After sending the quote to Liberty Mutual, the company cited a lack of proof and refused to cover the cleanup. "If you're responsible for something then take care of it and make it right," Edgerton said. When contacted by RTV6, Liberty Mutual said it does not publicly discuss claims. UPS said it is investigating the situation.